Stylized facts are often evoked in a very casual manner in the context of model validation, a practice that stands in contrast with their popularity and their potential. Given this situation, it is the aim of this chapter to characterize the concept of stylized facts from an epistemological perspective, which includes clarification of interesting ideas behind the concept, development of a definition and discussion of its possible uses for validating simulation models. The latter includes not only output validation but input validation and theory validation as well. Second, the need for a more systematic derivation of stylized facts is addressed. For this purpose, several approaches to establish stylized facts are presented and assessed. In this context, an additional approach is presented, which tries to overcome the shortcomings of current practice. 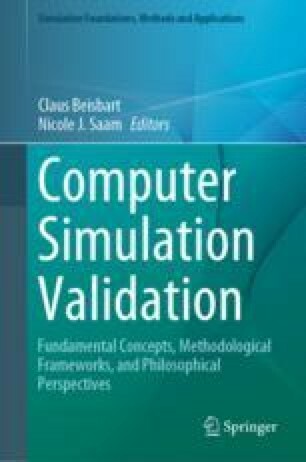 Together, these interrelated aims represent an attempt to strengthen the basis for the validation of simulation models using stylized facts. This paper benefits from many discussions with Bernd-Oliver Heine, with whom I developed many ideas presented in this paper. In this respect see also Heine et al. (2007). I also thank Volker Grimm and Uta Berger for very helpful discussions about their related concept of pattern-oriented modeling. Finally, I would like to thank the two reviewers and the editors of this handbook for their constructive and helpful comments.